Adam Jude's quick thoughts after the Huskies improved to 6-2 overall and 4-1 in the Pac-12 by defeating Colorado at Husky Stadium. Senior Myles Gaskin, the Huskies’ all-time rushing leader, missed the first game of his career with a shoulder injury. In his place, sophomore Sean McGrew started for the first time in his career, finishing with 58 yards on 12 carries. Sophomore Salvon Ahmed, limited by a knee injury at Oregon, gave the offense a jump-start late in the first quarter with back-to-back carries of 17 and 14 yards. He then scored the Huskies’ first touchdown on a 7-yard run, beating two Colorado defenders to the right edge. Fourth-string running back Kamari Pleasant added a 15-yard TD run later in the second quarter, bursting through a massive hold to reach the end zone untouched. That gave the Huskies a 14-10 lead. Even without Gaskin, the Huskies had more than 200 yards on the ground, and Ahmed finished with 73 yards on nine carries. Turnovers have been a problem for the Huskies, on both sides of the ball. 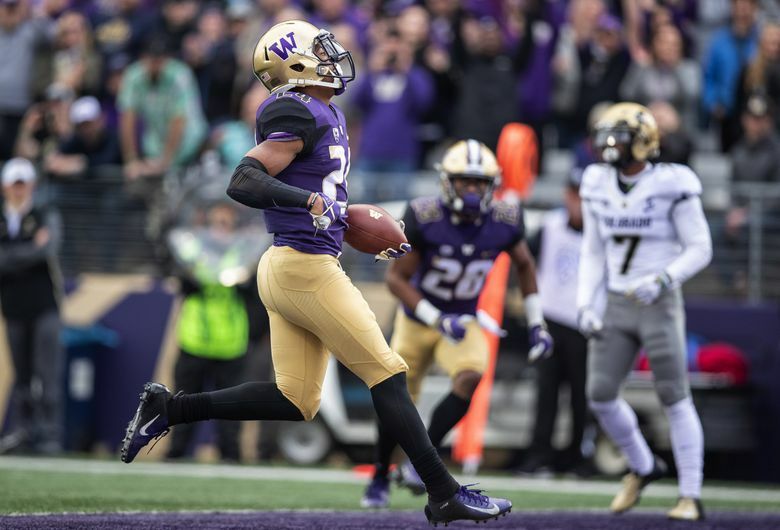 Washington came into Saturday with a minus-1 turnover margin — nine giveaways by the UW offense against eight take-aways from the UW defense in the first seven games — and turnovers cost the Huskies up to 17 points on Saturday. In the first quarter, safety JoJo McIntosh whiffed on a potential fumble recovery, only to have Colorado recover at its own 45-yard line. Three plays later, Colorado QB Steven Montez threw a 37-yard touchdown pass to freshman receiver Daniel Arias, a Mill Creek native making the first reception of his career. Late in the first half, Jake Browning threw an interception that set up a Colorado field goal. And, most devastating of all, junior receiver Chico McClatcher — trying to score at the end of a 14-yard reception — fumbled at the CU 1-yard line and the ball bounced out of the end zone, resulting in a touchback early in the fourth quarter. That gave Colorado possession at its 25. Ben Burr-Kirven was a bright spot again, finishing with 15 tackles and a late interception that led to UW’s final three points. Jake Browning, after a so-so performance, sealed the victory for the Huskies with a 27-yard touchdown pass to Aaron Fuller with 3:50 left in the game. That capped a 12-play, 84-yard drive that ate up nearly 6 minutes off the clock and gave the Huskies a 24-13 lead. With the win, the Huskies improve to 4-1 in conference play (6-2 overall) and keep pace in a crowded field in the Pac-12 North. Browning finished 15 of 25 for 150 yards, one touchdown and one interception.